Anesthesia Services of the Fox Valley are providers of anesthesia services. We deliver anesthesia at Mercy Medical Center in Oshkosh, Wisconsin; Fox River Periodontics located in Appleton, Wisconsin, Valley Endodontics Appleton & Oshkosh, and at Pinnacle Cataract and Laser Institute in Appleton. Please see our FAQs for information on billing. For medical record requests please contact the facility where your procedure was done. 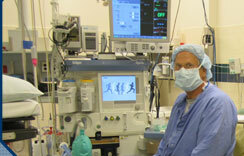 We employ both anesthesiologists and nurse anesthetists. Our anesthesiologists are all board certified or board eligible medical doctors. Our nurse anesthetists are all registered nurses who are graduates of an accredited nurse anesthesia program and are board certified.